So far we have dealt with continuous and sampled signals having defined waveshapes. Such signals are described as ‘deterministic’, and the frequency spectra we calculate for them specify the magnitudes and relative phases of the sinusoidal waves which, if added together, would exactly resynthesise the original waveforms. By contrast, the value of a random waveform or signal is not specified at every instant of time, nor is it possible to predict its future with certainty on the basis of its past history. 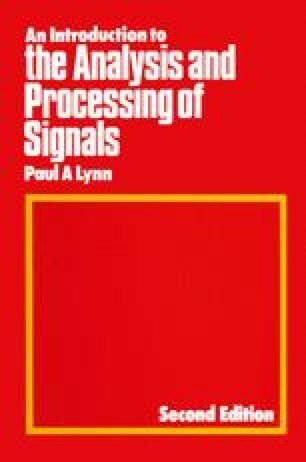 The reason for this is generally that we have insufficient understanding of the physical process producing the random signal; on other occasions, the understanding is present, but the effort involved in predicting the signal (or in describing its waveshape by a precise analytic function) is too great to be worth while. In such cases it is usual to evaluate some average properties of the signal which describe it adequately for the task in hand.